Because I spent most of the day running around with my brain in one room and my body in the other room (seriously, preparing to leave for just a few days is a MAJOR ordeal…can I get an AMEN!?! ), I needed a quick one pot dinner that each of us could eat with a bowl and spoon. Sensing my desperation here! In large saucepan, cook pasta according to package instructions. Drain in colander. Do NOT return to saucepan! 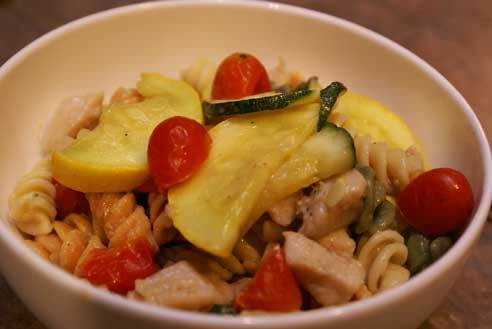 While pasta is cooking, dice the chicken breasts and cut the zucchini, squash, grape tomatoes and snap peas. 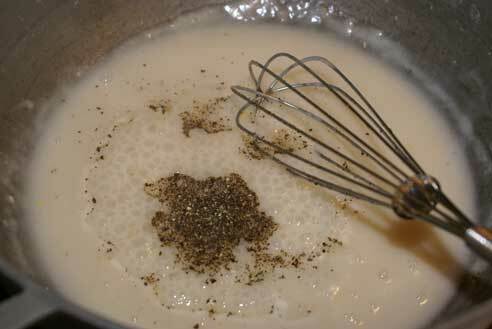 Once pasta is out of the saucepan, prepare cream sauce. Melt 2 Tbsp butter (I used a dairy-free variety). 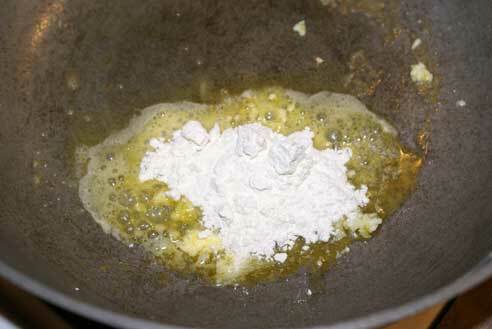 Once melted, add in 2 Tbsp flour and 1/2 tsp salt. 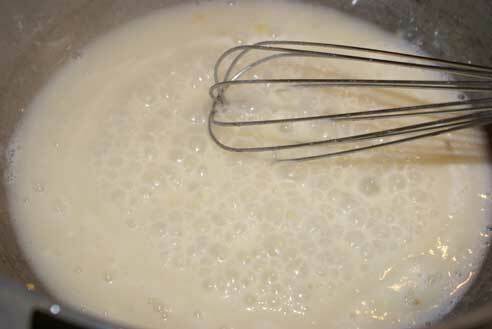 Use whisk to mix it into a paste. 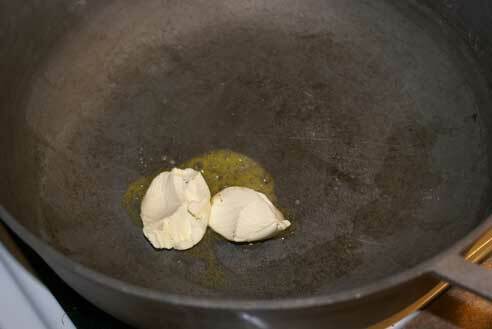 Once paste has formed, quickly add in 2-3 cups of milk (I used rice milk to stay dairy-free!). 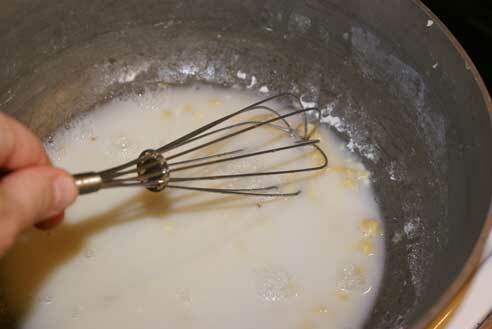 Whisk well until the pasty clumps have dissipated into the milk. Cook over medium heat for 2-3 minutes, or until starts bubbling. Once bubbling, the sauce is ready for a few mix-ins. Add 2 tsp red wine vinegar, crushed garlic, cracked pepper, diced chicken. Add about 2-3 Tbsp water in with the chicken, so the sauce doesn’t get too thick. 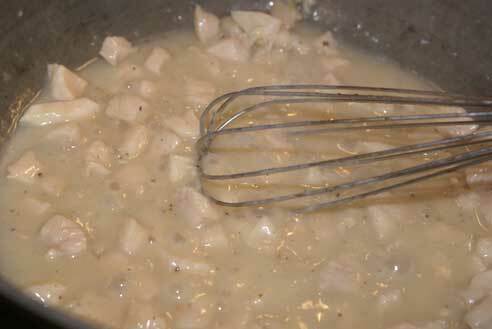 Stir often while the chicken cooks through, about 4-5 minutes (depending on how thick the diced chicken pieces are!). 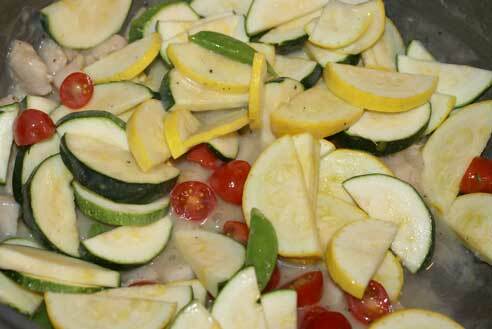 Once chicken has cooked through, mix in the cut vegetables. Cover and let cook for 4-5 minutes, or until vegetables have steamed. Mix in cooked pasta. Season with salt and pepper, to taste. Serve Garden Pasta Primavera in one bowl. With one spoon! Looks really good and possible to make gluten free. Thanks. Just subsititute rice pasta and flour. Easy to do GF! You must have had to run out to pick up some milk since I noticed that you only had one half gallon in you Kroger shopping trip and since the recipe calls for at least three cups surely you HAD to make a trip to the store. I’m sure your BOYS drink more then a single half gallon per week…..and only one or two half gallons of juice….boy they sure must drink lots of water. Wish my kids and Grandkids were like that. They like lots of milk, juice and other stuff like soda and Kool Aid as most kids do. I make my kids their rice milk in the blender. They are dairy free! How do you make rice milk in the blender, can you make that a post with directions when you get back? I love your recipes with ways to make things like this dairy free. My husband grew up keeping kosher, no meat and dairy mixed together, and I love ways to make my old favorites without making it so he wouldn’t want to eat it! This is my kind of meal. All my life, I did not care for vegetables and now I love them. This is a great recipe for me to put in the “to cook” file. I’m making this for lunch today…can’t wait to try it!